Meet more than 25 artists & makers, see their systems, patching tips and read about their story. Modular concepts such as VCOs, VCFs, ENVs, LFOs, VCAs and advanced techniques categorized and visualized. Printed in Denmark on 130g acid-free quality paper. 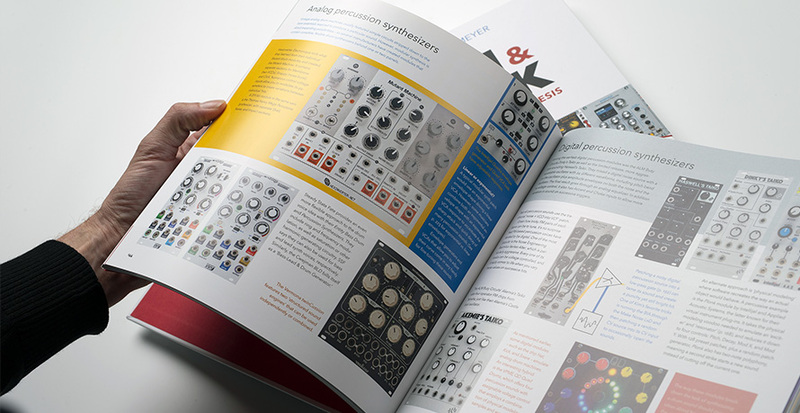 I’m not into modular synthesis yet, but I’m thinking about it - is the book for me? 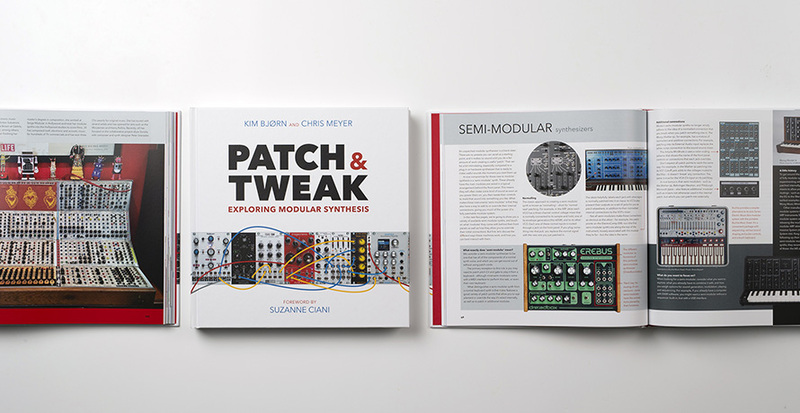 This book will be particularly useful for you, as we start with explaining how modular synthesis works, share its history and discuss potential starting points including semi-modular and software synths. Each section also starts by explaining the subject in terms a beginner can understand, and then moves upward showing you how to put what you’ve just learned to use. 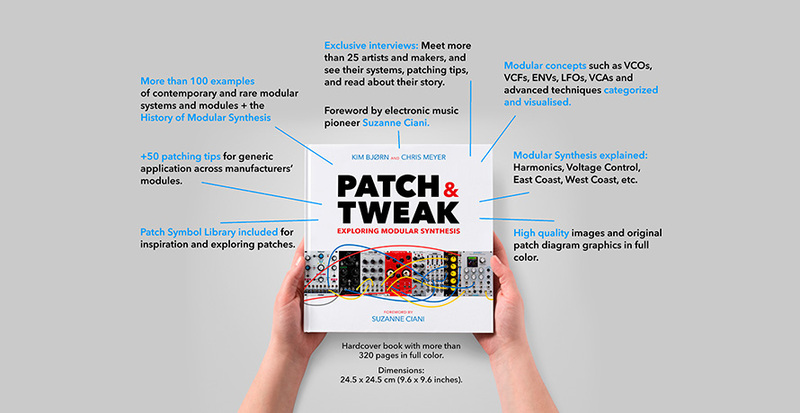 Is the book only about Eurorack? When it comes to discussing specific modules, we choose to go with Eurorack, as it is so widely used. However, the introductory sections cover a wide range of formats, including 4U and 5U/MU as well as semi-modular and software synths. And the synthesis concepts discussed also apply to any format. You will also find the interview subjects use a good variety of formats, including 4U (Ian Boddy and Serge) plus 5U (Robert Rich, Hans Zimmer, David Bessel of Node, Moon Modular, and more). I'd consider myself a long-time user and somewhat experienced - is this book for me? What's up with those patch symbols? Back in the 60s and 70s, there were several attempts to develop a universal symbol language to describe patches – some of these symbols even appeared on the front panels of instruments from ARP, PAiA, Korg, and more. However, they were largely forgotten after the 70s. We revived them as a way to share patches that can be recreated on a wide variety of modules, as well as show you what needs to be connected to specific modules to finish a patch. We will also be making these symbols “open source” to be used by individuals, manufacturers, and educators as they see fit. What's the main difference between PUSH TURN MOVE and PUSH & TWEAK? The main difference between the two books is that PATCH & TWEAK is much more focused on ‘how to’ than PUSH TURN MOVE. In PATCH & TWEAK, you will get concise advice on how to create sounds and patches that you apply directly to the sounds and music you want to create. PUSH TURN MOVE deals with the design of electronic music instruments and their usability but contains less advice on how to make music. However, for both books, there are compelling interviews with artists, who share their knowledge and love for making music with electronic devices. Also, PUSH TURN MOVE deals with all kinds of electronic music interfaces whereas PATCH & TWEAK deals with modular synthesis in particular.